The Boy Scouts of America requires any and all of the participants taking part in the scouting activities to complete this annual health and medical form, to be more specific, the parts A, and B. Part C is signed only when the scout is participating in any event that lasts longer than a span of 72 hours. These Medical Forms collect the annual medical data of the participants just to ensure if they are health-wise capable of performing such activities. This health safety BSA Medical Form contains the details regarding the informed consent, release agreement, and authorization. The scout signs this granting the local council and BSA the permission to release the proof of scout activities performed by him. You may also see BSA Health Forms. 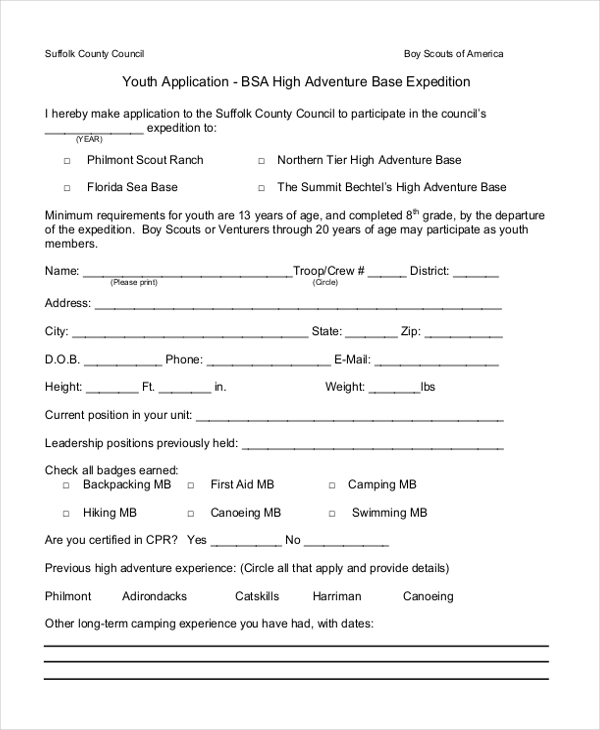 This form must be definitely filled during a high adventure trip as the trip could require the participant to take up extensive activities that may or may not result on a negative note. 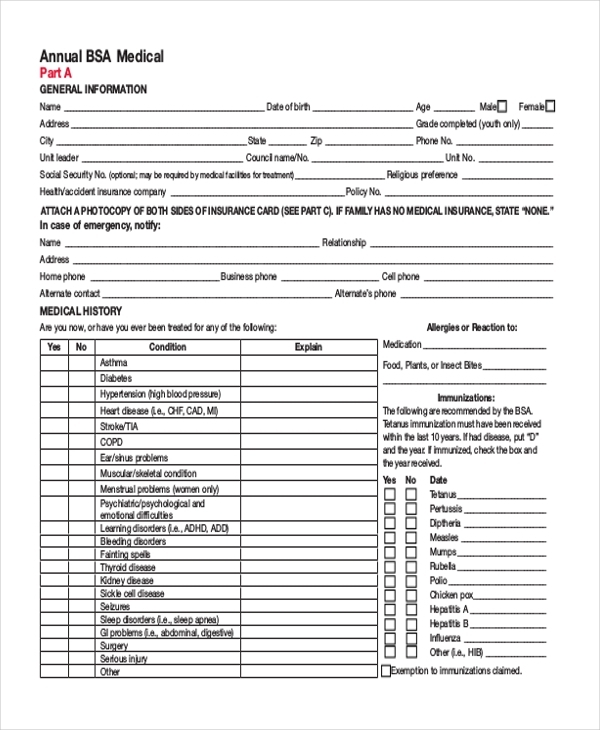 This particular form, just as the name says, collects all the data of the patient providing the authorities to take up necessary actions at times of injuries if any occurs to the participant. You may also see Medical Consent Forms. 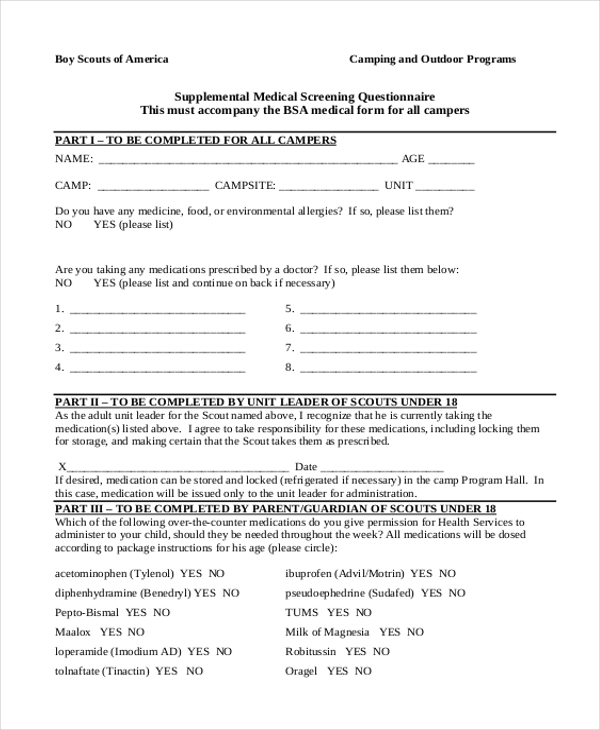 A BSA Camp Medical Form mandates the scout or participant to fill the health-related data showing the BSA that he is healthy and fit to attend the events and take up the tasks provided. 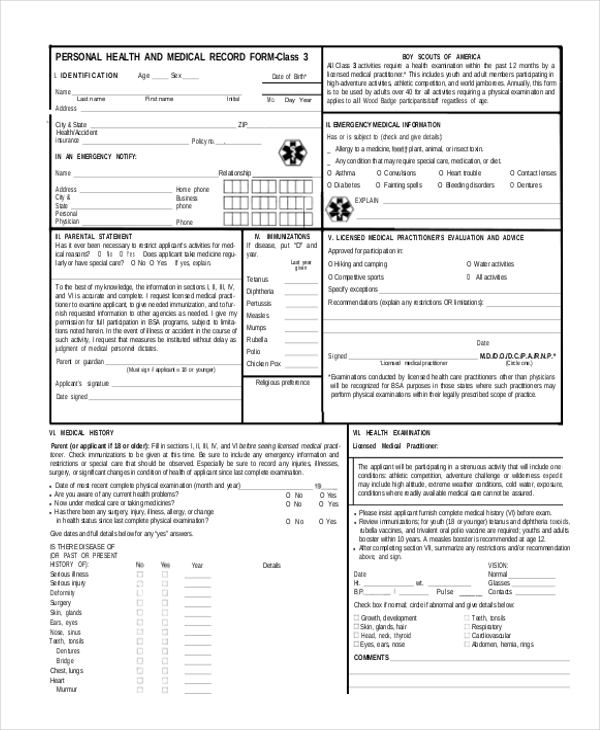 This form will accompany the BSA Medical Form. The form is divided into 3 parts, wherein the Part I will be filled by all, Part II will be filled by the unit leader of scouts aged under 18 and the rest will be completed by the parent or guardian of the minor scout. You can also see Medical History Forms. 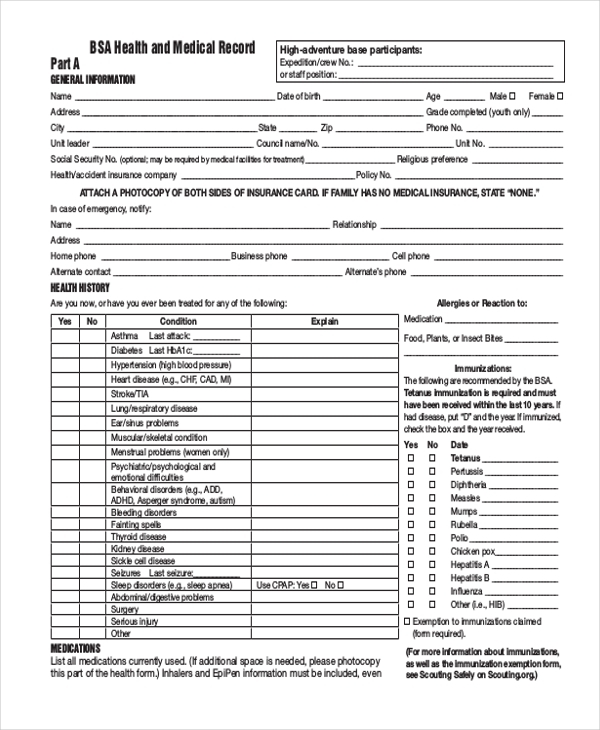 This Seabase medical form exceeds the BSA class III requirements. This sea base experience includes the effect of climatic conditions, recommendations regarding chronic illnesses, cardiovascular diseases, high blood pressure and many more related illnesses. All the discreet data gathered is used to conduct a safe Scouting program. The form will contain data of all the previous medical records of the participants from the event. Who is the Target Audience for These BSA Medical Forms? The target audience of the BSA Medical forms are clearly the participants who wish to take part in events that require extensive physical activities. 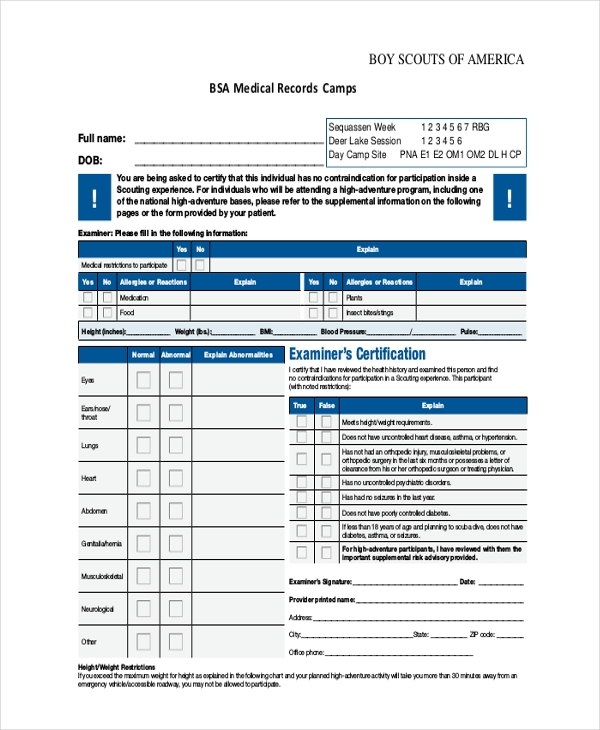 This form collects all the standardized health and medical information of the participant. This also serves as a tool that enables the council to operate effective camps, with a set of conditions that adheres to the rules and regulations of BSA and the respective state law. The form contains critical information approved by medical professional to treat a patient. This form can keep lawful occurrences or any unnecessary disputes away from the participant and the authorities. 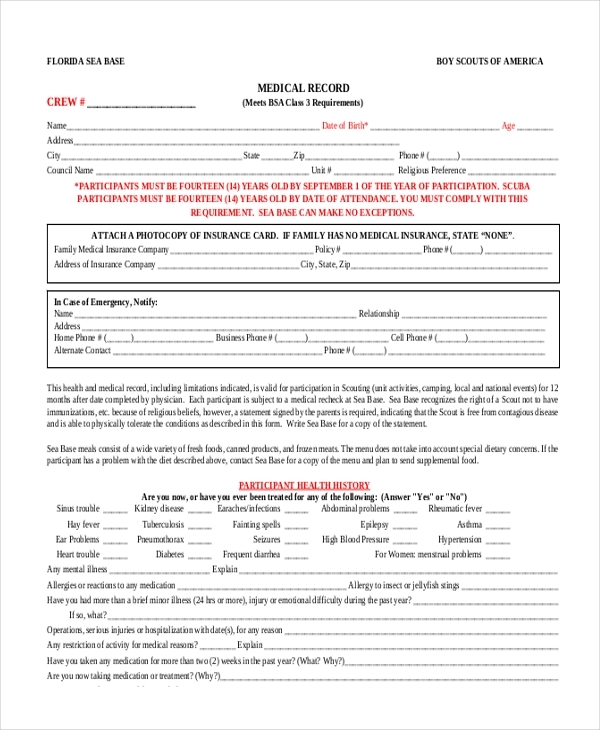 You may also see Medical Records Release Forms. What are The Benefits of BSA Medical Forms? The BSA Medical forms serve so many purposes. The major purpose is to promote health awareness. As a positive benefit, this collected data can be used in treating a participant if in any case of occurrence of illness or injury. This is again used as an emergency contact information. This helps the authorities in confirming the readiness of the participant’s physical conditions. You may also see Medical Waiver Forms. This act as a crucial part during the specialized activities. Some gatherings like the National Scout Jamboree requires extensive physical flexibility for the activities the event could put forth. During the same, these data will play a critical role. This form is to be mandatorily filled as it will contain all the possible fatalities and risk factors about the participant. All the participants will be required to fill the sections in the form accordingly. Yet, the information provided in these Medical Application Forms will be kept confidential at any cost. The form is valid for a year from the date it was attested by the medical professional.